See the previous post for recipe. Anytime I make pizza with fresh tomatoes, I always purge the tomatoes. Tomatoes are succulent fruits, but they are full of water. And water makes yummy pizza crusts soggy. 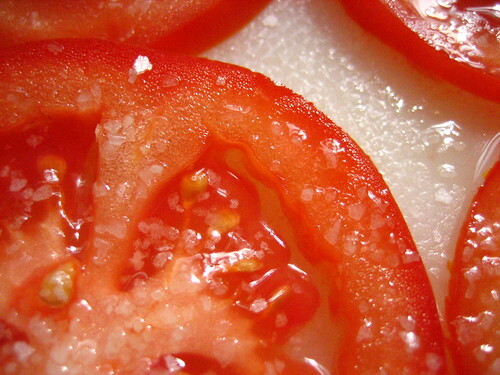 Get rid of the water in tomatoes by thinly slicing them and sprinkling them with flaky, subtle Kosher salt. The salt will pull out most of the moisture and flavor the pizza at the same time. I’d finish it with fresh basil, and I may even crack an egg in the middle and put it under the broiler for a few minutes right at the end. Bridget and I love to cook, and we always prefer meals that we can make in under 30 minutes. These Veggie Patch Pizzas definitely fall into this category. 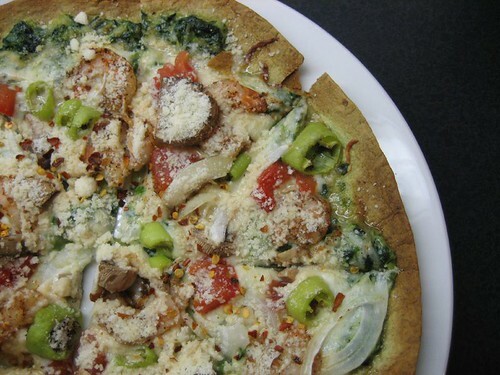 Start with a tortilla (we love the flavored ones), and top it with creamed spinach. I’ve always wanted to make my own, fresh creamed spinach, but Stouffer’s freezes an excellent creamy spinach. That’s the hard part. Next, top it with whatever you’d like. Keep in mind, however, that the tortilla is very thin, and very susceptible to moisture (sogginess). 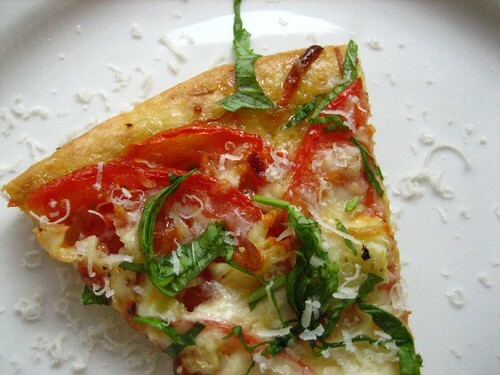 We usually top ours with fresh tomatoes (seeded), sliced onions, peppers, cooked shrimp, and mozzarella. Pop it in the oven at 375 until everything’s all bubbly and the edges are nicely browned. Finish with grated Parm and crushed red pepper flakes. 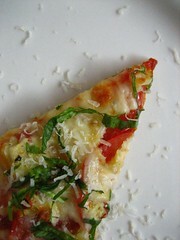 Simply Recipes made a post last week about ultra thin, tortilla crusted pizza. We’ll have to try it, too!